Within Teamwork Projects you can mark any notebook that you create as containing sensitive content. 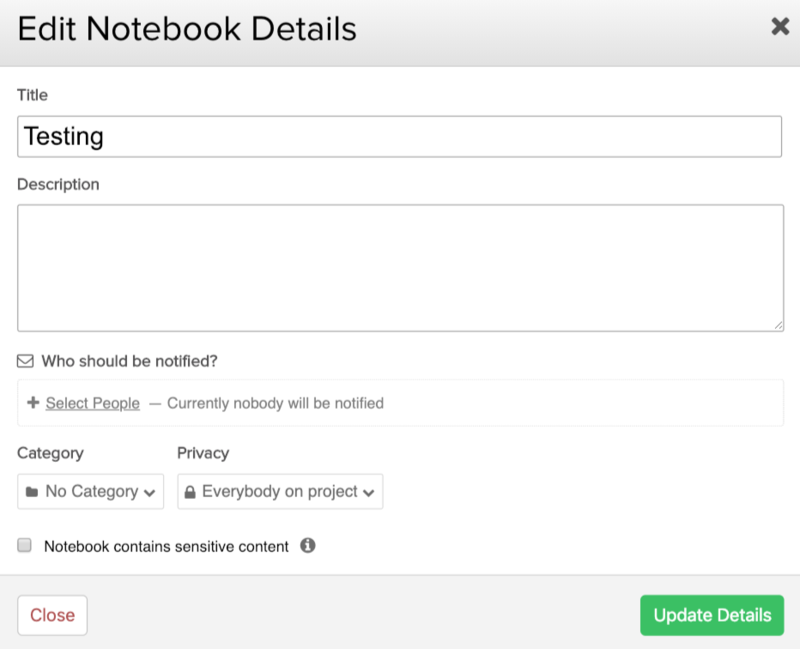 Marking a notebook as having sensitive content will stop the notebook information being included in related emails sent to users. You can choose to enable or disable sensitive content on any notebook that has already been created by choosing the Edit Details option beneath the notebook title. Note: The option to edit details will only appear when you hover your mouse over the title of the notebook. Once you have chosen the edit details option you will then see a pop up modal that includes the option to check or uncheck the option for sensitive content. When you are editing a notebook that has been marked as containing sensitive content, this will be noted below the notify options at the end of the editor. Any email notifications associated with the notebook will only include a link.